Thinking about taking off my roll cage and buying a roll bar, but I wanted to know if there is any difference between the two, am I losing anything by removing the roll cage? Or are the both basically the same? I know they're both for basically not dying if your car flips over, but if they do the same thing is there really any difference besides appearance? 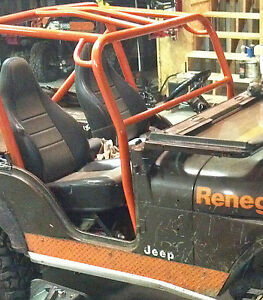 What roll cage do you have now? What Jeep? Obviously an actual real roll cage will give passengers a lot more protection than an actual real roll bar. What Jeep installs on modern models are neither. They're called 'sport bars' and are basically there for aesthetics and do very little in a roll-over. Factory Sport Bars are designed to be the crumple zone. This means they are designed to crush but supposedly only so far. When I flopped, my Sport Bar deformed almost an inch and it wasn't a hard flop. A Roll Bar is just that. A single bar designed to support the weight of the vehicle in the event of a roll over. It does not fully enclose the occupants. A Roll Cage is designed to support the weight of the vehicle and it encloses the occupants in the safety zone.